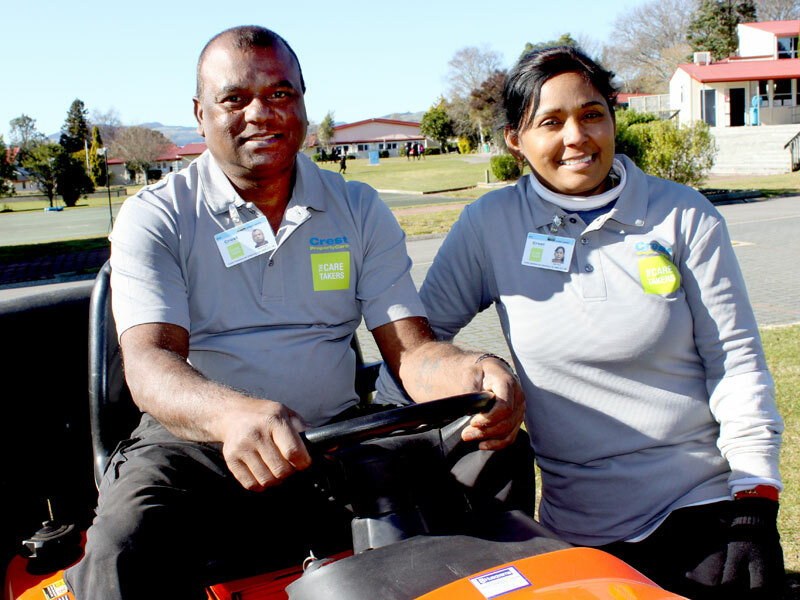 Hemant Kumar and Rajni Chand have made a big impression with staff at Rotorua Girls’ High School. They love their role at Rotorua Girls’ High School – but today their pride is shining brighter after the couple’s commitment to the job was officially recognised. Hemant Kumar and Rajni Chand are one of the first CrestClean couples in the country to gain a prestigious qualification in caretaking. The husband and wife team have just received a Certificate in Property CareTaking Level 2. But gaining the newly launched qualification is no mean feat. The programme covers three health and safety units plus a raft of core skills including, safe preparation of chemicals, safe care and use of hand tools, and the safe care of the tool shed. The caretaking course is delivered by the Master Cleaners Training Institute. Ram Kumar, Crest PropertyCare Operations Manager, says Hemant and Rajni do a fantastic job. They’ve made a big impression at Rotorua Girls’ High School with their attitude to do the best job possible, he says. “I have spoken to the school and they are very happy to have them there. Hemant can turn his hand to just about anything and has a background as a mechanic, Ram says. That’s come in handy, saving the school the cost of getting in an outside contractor for repair jobs. One example is when Hemant repaired a broken roller door in the school’s gymnasium. Other Crest PropertyCare personnel in schools around the country have been adept at tacking similar jobs. A caretaker at a school in Auckland wall mounted a number of TVs, saving many hundreds of dollars. “Our caretakers can undertake such tasks perfectly well. It’s a win-win for the school,” says Ram. 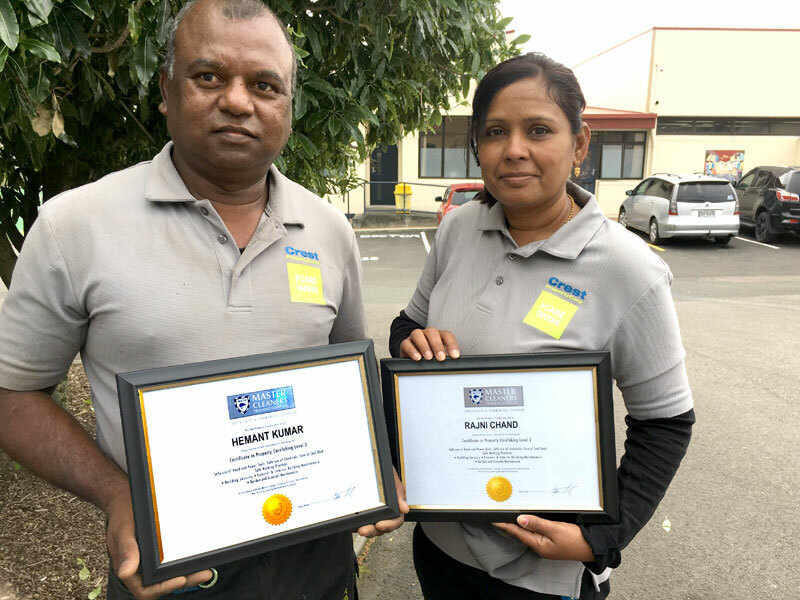 Bill Douglas, CrestClean’s Rotorua Regional Manager, says he is proud of Hemant and Rajni’s achievement. “They’ve done really well. 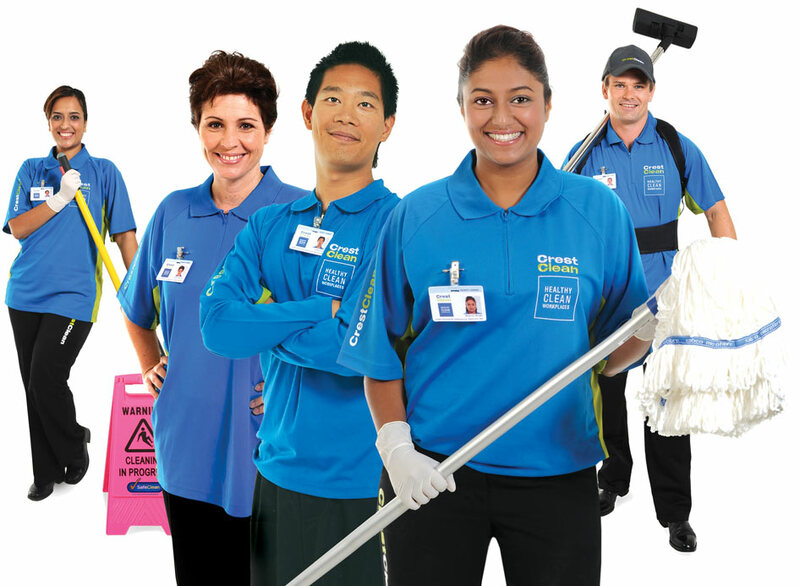 Rotorua has the biggest caretaking contract in the whole of New Zealand for Crest PropertyCare. “Hemant and Rajni do a fantastic job. They have fallen into their niche with this role.” Bill says having the having a contract arrangement for caretaking is working out well at Rotorua Girls’ High. Hemant Kumar and Rajni Chand are proud of gaining their Certificate in Property CareTaking.